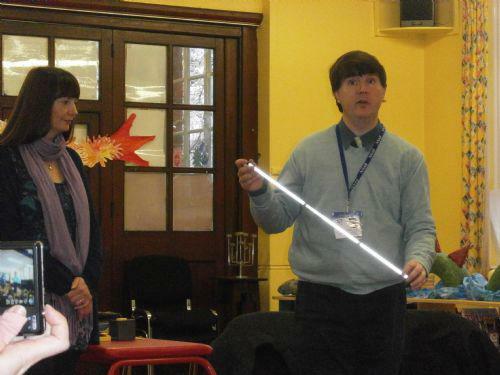 A blind man and his friend gave an assembly about the work of the NNAB. 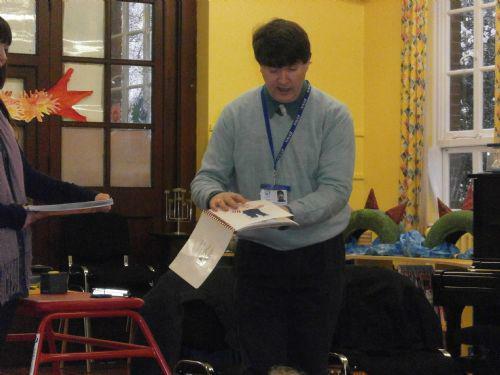 He spoke to the children about reading books in Braille and they had the opportunity to feel a book written in Braille. He showed the children the white sticks used to guide them and for people to know that they are blind and may need assistance. Also if there is red tape on the stick then that person is also deaf and may need assistance. The children learned to never approach a guide dog because the dog is working and must not be distracted. They were made aware of the difficulties of getting dressed and matching clothes. He had a tool that helps to sort money.